18 September 2017 – Iran is implementing its commitments under “the world’s most robust nuclear verification regime,” the United Nations atomic agency head said today, while at the same time voicing “grave concern” at the Democratic People’s Republic of Korea’s (DPRK) nuclear programme. 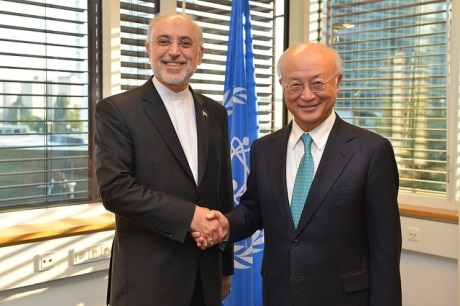 * * * “The nuclear-related commitments undertaken by Iran under the JCPOA are being implemented,” UN International Atomic Energy Agency (IAEA) Director General Yukiya Amano told the opening of the Agency’s annual General Conference in Vienna. Endorsed unanimously by the UN Security Council in 2015, the Joint Comprehensive Plan of Action (JCPOA), between its five permanent members (China, France, Russia, the United Kingdom and the United States), plus Germany, the European Union (EU) and Iran, set out rigorous mechanisms for monitoring limits on Iran’s nuclear programme, while paving the way for lifting UN sanctions against the country. “Iran is now subject to the world’s most robust nuclear verification regime,” said Mr. Amano, who was appointed by acclamation today to another four-year term as Director General of the 168-member Agency. Turning to the DPRK, he called upon it to comply fully with its obligations under all relevant Security Council and the IAEA resolutions. On 11 September, the Security Council unanimously imposed tighter sanctions on the DPRK, including limits on oil exports to it, banning its textile exports and its access to gas liquids, and more closely inspecting cargo ships going in and out of its ports. The Council has passed eight resolution over the DPRK’s nuclear programme since it withdrew from the Nuclear Non-Proliferation Treaty (NPT) in 2003, many involving increasingly severe sanctions. Turning to other matters within the Agency’s remit, Mr. Amano stressed its unique role in transferring nuclear technology to developing countries, and its work in supporting countries achieve the UN Sustainable Development Goals in energy, food and agriculture, industry, water management and health. “The Agency will continue to deliver high-quality programmes and respond promptly to Member State needs,” he said, noting that the modernization of the IAEA nuclear applications laboratories near Vienna was making excellent progress and the new Insect Pest Control Laboratory would be inaugurated in a week’s time. “When completed in a few years’ time, the expanded laboratory complex will greatly increase our capabilities as a technology holder,” he added.